When confronted with the possibility that Barack Obama could become president, I was horrified. At the time, John McCain was the Republican nominee for president. No vice presidential candidate had yet been named. I could almost hear the crickets chirping at McCain campaign headquarters. We were running a moderate against a charismatic hard campaigner who had the polls breaking in his favor. The Republican party was in disarray and there was public backlash to the party because of the people's unhappiness with George W. Bush. The dark years were about to begin. Then John McCain named Sarah Palin to be his running mate. The pain, despair and helplessness of having to endure a horrific Obama administration had just been eased - tremendously. This blogger couldn't tell you how traumatizing it would have been to live through the Obama administration if Sarah Palin didn't exist. The idea of being without a voice during what is about to become the most horrifying period in my political life was too frightening to face. The pain has been eased. The despair and helplessness has turned to hope and optimism. Why? Because there is this wonderful lady in Alaska who carries the torch. She possesses the spirit of Ronald Reagan in her "servant's heart." She is the true embodiment of our political philosophy. She is our voice. Sarah Palin said "Americans have to be paying attention, and we have to have our voices heard and ultimately it needs to be our will, the American people's will, imposed on Washington instead of the other way around." Sarah Palin's will, my will, your will. "Our will." It's all one. 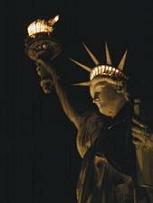 As she hold's liberty's lamp to guide our way, we begin our journey back to that shining city on a hill.